1995: The Victorian Year in Steam: 1995 was the year of massive infrastructure change on the Victorian system. Final broad gauge steam workings of Maryborough - Ararat and Melbourne - Dimboola ushered in the Melbourne - Adelaide standard gauge link. The hand operated gates at Gisborne saw their last steam loco just weeks before being removed. 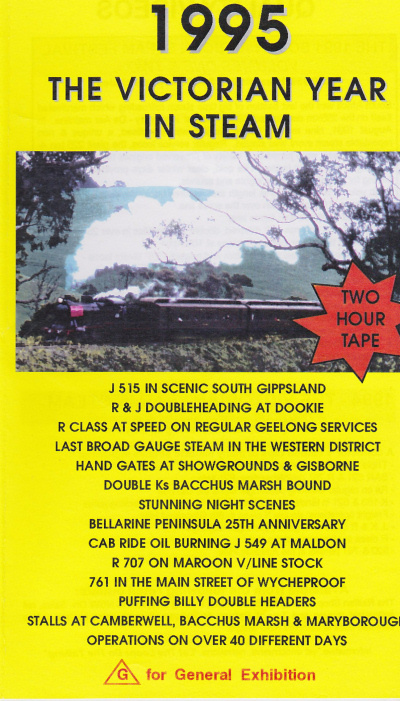 Enthusiast special and charters roamed all corners of the state, while the scenic hills of Gippsland echoed to the whistle of a J class for the first time in 7 years. Copyright (c) 2014 Stylized. All rights reserved. Designed by NodeThirtyThree for Free CSS Templates.